The Kohlenberg Lyceum Series Presents "A Christmas Carol"
Kevin Baiotto, former coordinator of Kirksville’s Telecommunications Resource Center, received the “Community Partner of the Year Award” recognized at the Community Partner Appreciation Luncheon Nov. 3. Baiotto was nominated by Cody Hagan, SIFE president. He works with the Kirksville Sheltered Workshop, a business that creates meaningful employment opportunities for the developmentally disabled in the area. Truman SIFE members worked with Baiotto helping the managers of Kirksville Sheltered Workshop write a business plan that would enable them to set out on their own. Baiotto’s outreach to Truman SIFE students helped them to gain experience in developing business plans and working with non-profit organizations. SIFE has also worked with Baiotto and the Kirksville Sheltered Workshop to create a manager evaluation form for the business. Baiotto’s work with SIFE extends beyond the service opportunities he has helped the members find. He serves as a member of the organization’s Business Advisory Board and has been active in various facets of the organization. Students present the Community Partner of the Year Award to Kevin Baiotto. From left to right: Jessie Eubank, SIFE vice president of communications; Baiotto, award recipient; Cody Hagan, SIFE president; and Lynn Dreisilker, event coordinator. The Community Partner of the Year Award nominees stand with their certificates. Back row, left to right: Terri Cross from Northeast Missouri Community Action Agency, Michelle Yoder of Kirksville Middle School, Breanne Hunt of Lifeline, Deb Wohlers of Adair County SB40/Developmental Disability Board, Kevin Harrison of K-Life and Nancy Pride of Kirksville Manor Care. Front row, left to right: SIFE members Tim Cooper, Jessie Eubank and Cody Hagan representing and collecting the award for Baiotto. The Spring 2012 Missouri Government Interns were given the rare opportunity to hear from Senator David Pearce, the Missouri Senate Education Committee Chairman, at their recent informational meeting. The interns will spend the semester in Jefferson City, Mo., earning up to 15 hours of college credit while working with either a legislator, public official or state agency. Pictured, front row, left to right: Nick Henderson, Julie Quinn, Heidi Geisbuhler, Queene Alara, Isaac Robinson, Nicola Fish and Devin Heier. Second row, left to right: Michaela Martinez, Kyle Olmstead, Josh Foster, Alan Phipps, Joy Bulen, Senator David Pearce and President Troy Paino. Top Row left to right: Andrew Robbins, Alex Feurer, Julia Stoverink, Christopher Vick and Luke Freeland. Not pictured: Adam Schmid. 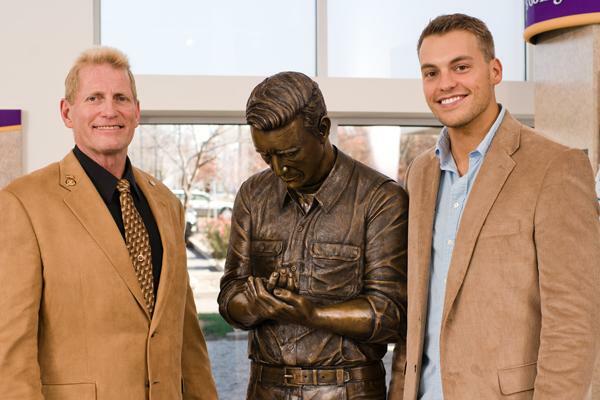 John Barker (left) stands with local artist Brandon Crandall and Crandall’s sculpture “The Purple Heart” in the Ruth W. Towne Museum and Visitors Center. The statue was dedicated as part of the 2011 Veterans Day ceremony that took place Nov. 11 and will be located permanently at the Towne Museum. Barker was in attendance to pay tribute to his brother Jedh Barker, a former University student who lost his life during the Vietnam War. For his heroic actions, Jedh Barker posthumously received the Medal of Honor, the only Truman student ever to receive the award. 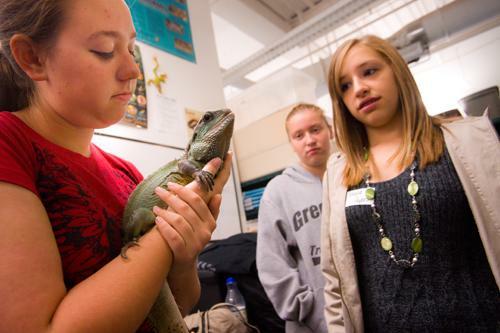 Natalie Ayers and Katharina Bryant, eighth grade students from Green City, look at a lizard in the Biology Department. Seventh and eighth students from Green City and Milan visited campus Oct. 18 for Shadow Day, a program aimed at encouraging college enrollment for future students in the surrounding areas. Students toured campus, visited three departments and ate in the residence halls. The Kohlenberg Lyceum Series continues on Nov. 29 with “A Christmas Carol.” This holiday production performed by NTC PRODUCTIONS will take place at 7:30 p.m. in Baldwin Hall Auditorium. NTC PRODUCTIONS adapted this production in 1979 and has toured annually ever since. 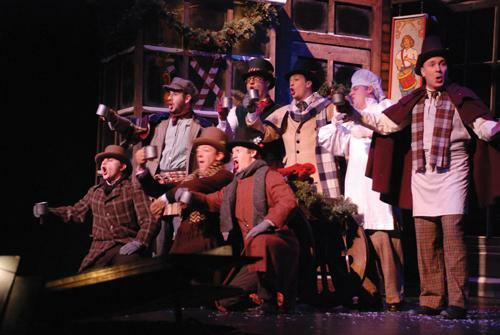 The company makes this widely-performed classic original with a Victorian theme and the integration of traditional Christmas carols into the narrative. The songs themselves are traditional, but musical arrangements courtesy of John Bennett are contemporary. NTC PRODUCTIONS' "A Christmas Carol"
Charles Dickens wrote his “ghostly little tale” in 1843, and “A Christmas Carol” has since become one of the most beloved holiday traditions of all time. This fable depicts Scrooge, whose values are focused exclusively on profit. The story explores the protagonist’s conflicts with the struggling Cratchit family, whose tragic problems typified the working class during the Industrial Revolution in Victorian England. The touching climax is based on Dickens’ belief that the ills of a greedy world can be healed by brotherhood and unselfishness. “A Christmas Carol” features a spirited ensemble of 28 performers who bring Dickens’ fable of redemption to life on a magical set, including a spinning bed, created by designer James Othuse. This show, adapted by Charles Jones of the Omaha Community Playhouse, is sure to spark the holiday spirit. Free tickets are available now for students, faculty and staff. Students may pick up their tickets at the Student Activities Board Office in the Student Union Building. Faculty and staff may acquire their tickets at the information desk in the Student Union Building. The Truman Bookstore, a Follett Higher Education Group, is a Platinum level sponsor of this event. For additional information, visit lyceum.truman.edu or contact 785.4016. When Catherine Walker arrived at her first therapy session at Truman’s Speech and Hearing Clinic a few years ago she could not speak. Her mother, Kimberly Walker recalls the days not so long ago when her daughter only communicated through sign language. Catherine is only seven years old and although she is still receiving therapy, a huge stride has been made as she is now verbally communicating. Her journey to the clinic for twice-a-week sessions has given hope for Catherine, which is something the Walkers were not always sure they could have. Catherine Walker, left, works with Truman student clinician Katie Shirmulis during a therapy session at the Speech and Hearing Clinic. Catherine and her two brothers have all received treatment at the clinic. Truman’s Speech and Hearing Clinic has been helping residents from Kirksville and the surrounding area since 1960. In November, the clinic moved into new facilities located in the Truman Health Sciences Building. The clinic serves any individual with disorders of speech, language, voice, fluency, aural rehabilitation and swallowing, all at no cost to the people served. The quality of care at the Truman Speech and Hearing Clinic is something Kimberly Walker can attest to, as Catherine is her third child to receive treatment. Walker’s son Jonathon started coming to the clinic when he was eight years old after being diagnosed with central auditory processing disorder. Children affected by CAPD cannot always separate verbal messages from non-essential background noises. Now age 15, Jonathon has progressed to the point where he no longer needs to attend therapy sessions, however, Walker’s 10-year-old son Kristopher has also been diagnosed with CAPD and has been making progress through the Speech and Hearing Clinic for the last three years. Not only was the Truman Speech and Hearing Clinic the first option for Walker, it was also her only hope. As each of her three children needed speech or auditory therapies, she only had one place to go. “I didn’t have any other options,” Walker said. The Walkers are just one of several families who have received help from the Truman Speech and Hearing Clinic. Truman’s senior and graduate student clinicians benefit from the real-life experience by having the ability to provide therapy. Faculty members who hold the Certificate of Clinical Competence and a license to practice in Missouri supervise students. Mikail Brown is a sophomore communication disorders major at Truman and regularly does observation hours at the clinic. “Just by observing from behind the scenes, I see lives changed,” Brown said. No-cost clinics are rare due to the necessary heavy reliance on donations. The Speech and Hearing Clinic provides free services thanks to the support of the University and from community organizations. Paula Cochran, chair of the Communication Disorders program at Truman, accepts a $10,000 donation from Jack Kairy, president of the Scottish Rite Valley of Columbia, Mo. 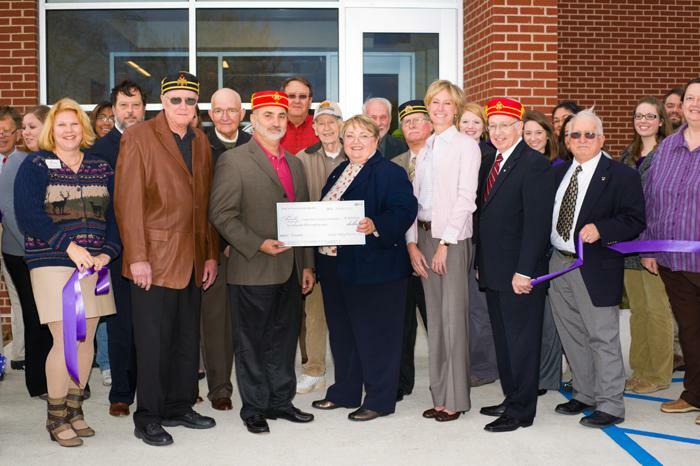 One major benefactor to the Speech and Hearing Clinic over the years has been the Scottish Rite Valley of Columbia, Mo., an affiliate of the Scottish Rite, a national Masonic organization. During the Speech and Hearing Clinic’s open house Nov. 12, the organization made a contribution of $10,000 to the Truman State University Foundation to support the Communication Disorders Department, which oversees the clinic’s operations. Thanks to these donations, families like the Walkers can turn to the Speech and Hearing Clinic to seek the help they need. Today, Catherine is able to focus on pronunciation so that she can become more comfortable with the language she is more than able to speak. The Truman Speech and Debate Team took home four awards at “The Mule” tournament at the University of Central Missouri Nov. 4-6. The tournament consisted of separate debate and individual events competitions. During the debate portion, the team competed against the top teams in the nation. Freshman Maddie Ebert made it to the semifinal round of Lincoln-Douglas debate where she lost on a close decision to the eventual tournament champions. Sophomore Kristen Wright made it to the final round where she placed second. The second half of the tournament consisted of individual (speech) events competition. The team earned two new qualifications for the national competition taking place in April. Korey Anderson earned his first individual events qualification by placing sixth in extemporaneous speaking. Wright also qualified by placing second in extemporaneous speaking. The team has one tournament remaining this semester at the Ohio University swing tournament in December. This is one of the largest tournaments of the year. For more information on the team, contact Kristi Scholten at kscholten@truman.edu. The Department of Commerce’s (DOC) Internship for Postsecondary Students Program, administered by Oak Ridge Institute for Science and Education, has slots remaining in Washington, D.C., for the spring semester. The internship provides students the opportunity for hands-on education and training related to their fields of interest and those of the DOC. Positions can be part-time or full-time and opportunities exist in various programs including business, sociology, statistics, communications, international affairs and other fields. Students must be U.S. citizens and have a minimum 3.0 GPA. A stipend is provided, along with housing and transportation allowances. Applications are due Dec. 1. For more information, visit see.orau.org/ProgramDescription.aspx?Program=10038. 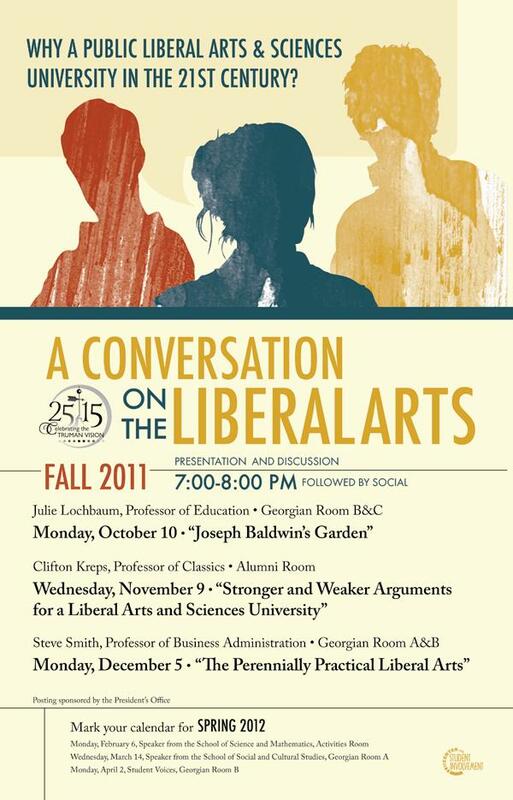 Tickets are free for students and $5 for general admission. They may be picked up at the Student Activities Board Office located in the lower level of the Student Union Building. For more information, call the SAB Office at 785.4722. Office hours are 9:30 a.m.-3:30 p.m. Monday through Friday. The Career Center is now in their new location in the Student Union Building 3100. They will be hosting an open house from 11 a.m.-2 p.m. Dec. 7. Stop by for hot chocolate, cookies and a tour of the new office. Students can register for a $100 gift certificate to the Truman Bookstore to use on next semester’s books. 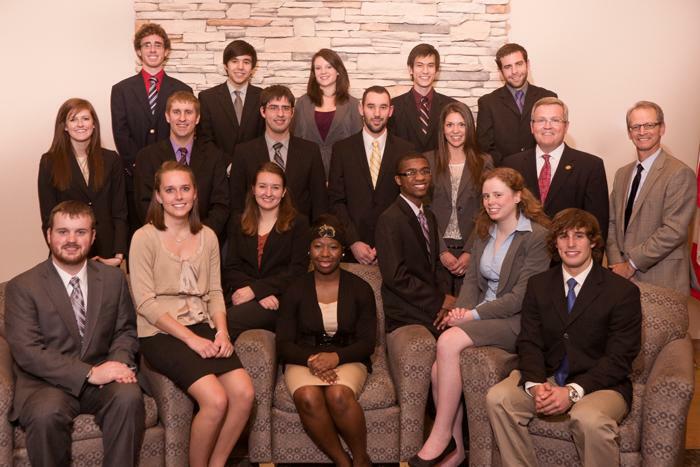 Phi Kappa Phi is the oldest and largest national honor society which recognizes and encourages superior scholarship in all academic disciplines. Established in 1897, it has very high academic standards, electing from the upper 7.5 percent of students in their junior year, the upper 10 percent of senior students and outstanding graduate students, alumni and faculty of selected institutions. 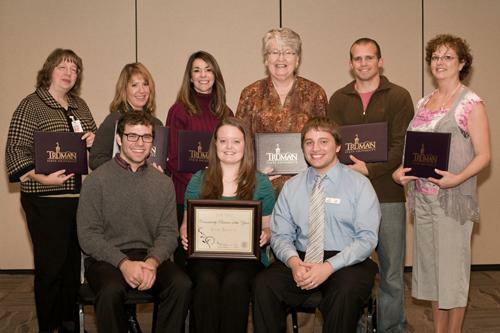 The Truman chapter was chartered in 1991 and is celebrating its 20th anniversary in 2011. On Nov. 9, Clifton Kreps, professor of classics, presented the second program in Truman’s year-long series “A Conversation on the Liberal Arts.” A copy of Kreps’ remarks, entitled “Stronger and Weaker Arguments for a Public Liberal Arts and Sciences University,” has been added to the President’s Office website located at blogs.truman.edu/presoffice/. Join Staff Council in ringing bells for the Salvation Army’s Red Kettle Campaign on Dec. 3. We are staffing shifts between 4-8 p.m. If you are interested in staffing an hour or two, contact Stacy Tucker-Potter at stuckerpotter@truman.edu. 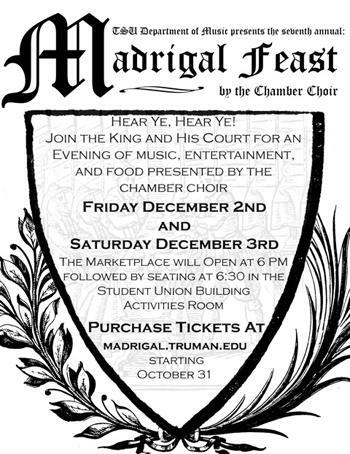 The University Chamber Choir presents their annual Madrigal Dinner taking place Dec. 2-3 in the Student Union Building. The marketplace will open at 6 p.m. in the Student Union Building HUB followed by an evening of music, entertainment and food beginning at 6:30 p.m.
in the Student Union Building Activities Room. Tickets are $23 for adults, $17 for students and $17 for children. They can be purchased at madrigal.truman.edu. The Harry S. Truman Presidential Museum and Library is seeking two summer interns to work at the library in Independence, Mo. Applications are now available for paid assistantships in France to help elementary and secondary teachers with English in French classrooms. The program begins in late September and ends in early April or May. The contract may be extended. Assistants receive a monthly stipend and governmental health among other benefits. Applicants must have intermediate to advanced skills in French and be between the ages of 20-30 by Oct. 1, 2012 at the beginning of the contract year. The application requires two letters of recommendation with one from a French instructor, a modest application fee and a formal medical report. Applications are due Jan. 15. For additional information, contact gsiewert@truman.edu. 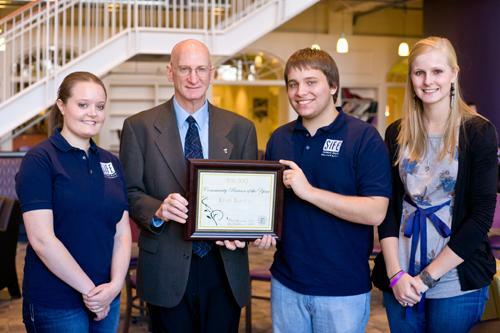 National Residence Hall Honorary (NRHH) is an organization that exists to recognize excellence in the Truman Community. One main way the NRHH does this is by nominating both individuals and organizations on campus for “Of the Month” awards across 15 categories. Do you know a staff member who has done exceptional work? Nominate them for a Point of Excellence Award at hr.truman.edu/recognition/excellence/. Do you know an office that provides excellent customer service to faculty, staff and students? Nominate them for the Bulldog Award at hr.truman.edu/recognition/bulldogaward/index.asp. Nominations are due by Dec. 15. The Foreclosure.com Scholarship Program will award five undergraduates with minimum $1,000 scholarships. Students must respond to a prompt explaining that they have acquired $150,000 in cash to be used specifically for a distressed real estate purchase. They must outline a detailed strategy that ensures maximum return on investment, personal satisfaction and/or financial profit. Responses must be between 800-2,000 words and submitted by Dec. 1. First place winner will receive $5,000. Second through 5th will receive $1,000. More information can be found at foreclosure.com/scholarship. Your Local Security is sponsoring “America’s Best Blogging Scholarship” for $1,000. Students may enter by posting responses to the question asking to define the single most important issue in the upcoming 2012 election. Students must explain the issue and why and how they propose the U.S. comes to a solution that benefits the majority. After posting, students must include the embed code and share online via Facebook, Twitter and Google+. Entries will be judged by content and validation and “tweets,” “likes,” “stumbles” and “+1s” will be taken into account. The submission deadline is Dec. 31 and the winner will be announced Feb. 1. More information can be found at yourlocalsecurity.com/scholarship. U.S. Bank is awarding 40 scholarships in the amount of $1,000 through a random drawing process. Undergraduate students attending an eligible four-year college or university participating in the U.S. Bank No Free Education Loan Program are eligible to apply. More information about this scholarship opportunity can be found at usbank.com/studentloans. Scholarships are available through Federated Garden Clubs of Missouri, Inc., for the 2012-2013 academic year. Last year they awarded more than $13,000 in scholarships. Two students selected by the Federated Garden Clubs of Missouri will be submitted to Central Region as an applicant and to National Gardens Club Inc., as a Missouri applicant and will compete for a Central Region and National Scholarship. The application is available at www.gardenclub.org/Youth/Scholarships.aspx. The deadline to apply March 1. Have a chance to win a $100 bookstore voucher and other great prizes. 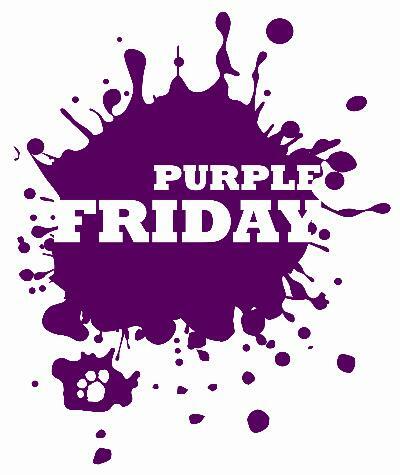 Show your Truman spirit by wearing purple. For information about numerous off-campus events, click on the Kirksville tab in TruView. For on-campus activities, check out the Master Calendar on the Truman homepage and at calendar.truman.edu. President Paino will host a “Coffee with the President” from 2:30-3:30 p.m. Nov. 29 in the Student Union Building Conference Room. The regularly scheduled “Coffee with the President” events are part of an effort to keep the lines of communication open between the president and the campus. There will be no set agenda. The sessions are intended to provide an opportunity for individuals on campus to come and ask questions about issues facing the University. Feel free to stop in and visit with President Paino during that time. More information is available at president.truman.edu/CoffeewiththePresident.asp. The Freshman Theatre Seminar class will present their Freshman show, “An Adult Evening of Shel Silverstein” at 8 p.m. Nov. 29 in James G. Severns Theatre. The Physics Colloquium continues at 4:30 p.m. Nov. 30 in Magruder Hall 1000. William H. Miller of the Nuclear Science and Engineering Institute at the University of Missouri–Columbia will present “Perspective on the Japanese Fukushima Nuclear Power Plant Disaster.” This is an introductory level presentation and snacks will be provided before the event. For more information on the colloquium visit physics.truman.edu/colloquia/mainstage.asp. There will be a Jazz Combo Concert at 7 p.m. Nov. 30 in Ophelia Parrish Performance Hall. The American Association of University Professors (AAUP) will conduct its monthly meeting at 12 p.m. Dec. 1 in the Student Union Building 3201. Contact Marc Becker at marc@truman.edu or call 785.6036 for more information. Wind Symphony I will perform a concert at 8 p.m. Dec. 1 in Ophelia Parrish Performance Hall. The Independent Performance and Art Coalition presents “Parabole,” a drama about the Christian love story and the role of humanity, at 8:15 p.m. Dec. 4 and Dec. 7 in the Student Union Building Down Under. The drama is written, directed and performed by students and is free of admission. The deadline to submit abstracts for the WGST Conference is Dec. 5. Submissions may be sent to tsuwgstsubmissions@gmail.com with “WGST Conference Abstract” in the subject line. There will be a Guest Percussion Artist Concert featuring Nathan Daugherty at 8 p.m. Dec. 5 in Ophelia Parrish Performance Hall. The BFA/BA Thesis Exhibit Public Reception will take place at 6 p.m. Dec. 6 in the University Art Gallery. The Theatre Department will host the Director’s Showcase at 8 p.m. Dec. 8-10 in James G. Severns Theatre. Admission is free. Cantoria’s 46th Annual Pancake day will take place from 8 a.m.-2 p.m. Dec. 10 at the First Christian Church located at 100 N. High Street. For more information email mdj@truman.edu. Mail services has now moved to General Services Building 109.